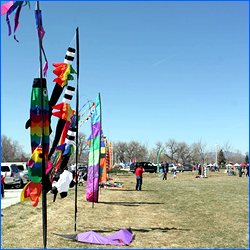 The Arvada Kite Festival is an annual tradition celebrated during National Kite month each spring in Arvada Colorado. Along with the beautiful assortment in the sky of flying creations of all shapes and sizes, there exist a number of activities, food, vendors, inflatables, and more for kids to have a great time. The festival includes competitions and awards for Kites and Kite Flying and more. Free parking and shuttle service available. Tags: Arvada CO Kids Events, Arvada Festival, Arvada Kids Events, Arvada Kids Kite Celebration, Arvada Kite Day, Arvada Kite Fest, Arvada Kite Festival, CO Kite Festival, Colorado Kite Festival, Denver Kids Kite Festival, Fly a Kite Denver CO, Kids Activities in Arvada, Kids Events in Arvada, Kite Day in Arvada CO, Kite Festival Colorado, Kite Festival Denver CO, Kite Festival in Denver, Kites in Denver CO, Stenger Complex Arvada, Stenger Soccer Complex, Stenger Soccer Fields, When is the Arvada Kite Festival? 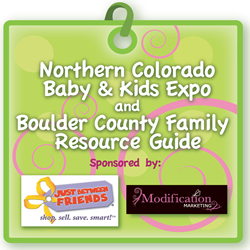 The Northern Colorado Baby & Kids Expo is truly a unique experience where you can discover what is best for you, your pregnancy, baby, kids as well as the rest of your family. Come and see the latest, safest, and most practical baby products, schools, activities for families and so much more! Learn about local companies and services that cater directly to you and your family’s needs. The Easter Eggstravaganza event takes place in Aurora Colorado in April. 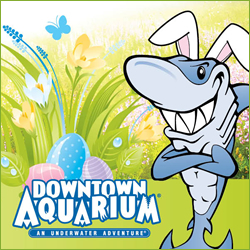 This special Easter Event by Kidgits is a chance to meet the Easter Bunny and get photos, complete with an egg hunt, fun games, dancing and more! 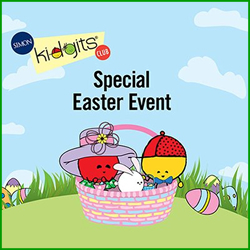 Enroll in the Simon Kidgits Club for the Egg Hunt and other great membership activities. 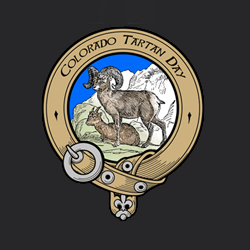 The Cool Science Festival takes place in Colorado Springs Colorado in April. 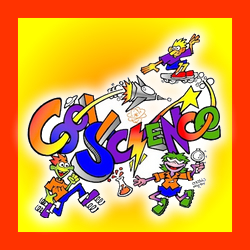 Join in the educational fun and discover how science, math, and engineering is really FUN! Great demonstrations and shows, with tours and wonderful hands-on activities and projects for kids. FREE! 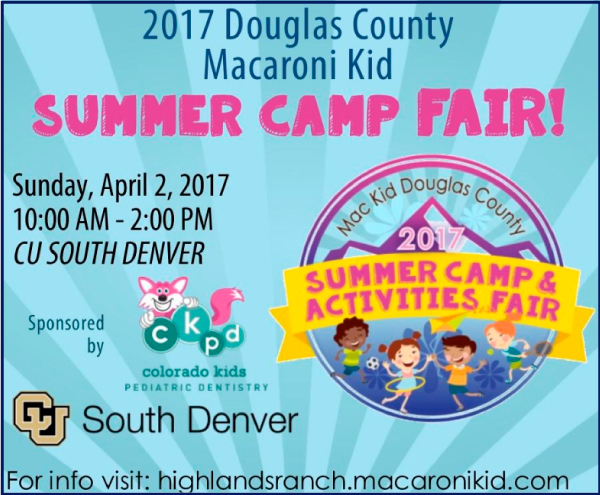 Macaroni Kid Highlands Ranch-Parker-Castle Rock-Lone Tree is excited to announce our second annual Mac Kid Douglas County Summer Camp & Activities Fair! 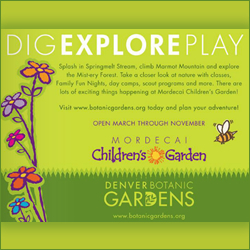 For local parents, this event is a one-stop community-focused event designed to give families the opportunity to meet face-to-face with the best camps, summer activities, and more in and around Douglas County. • Registered attendees will be entered to win* a $200 gift certificate for the participating camp/activity of their choice. • First 200 families will each receive an event bag (one per family). 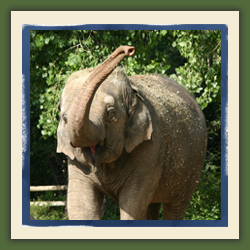 • Admission to CU South Denver’s The Wildlife Experience and access to all museum exhibits and galleries is included for all attendees. • Bring a school supply donation for the Douglas County Educational Foundation’s annual county-wide Land a Hand School Supply Drive and receive a special treat! Admission is FREE! Mark your calendars NOW to attend! Stop by and see the princesses from 11-4 each day at the Northern Colorado Baby and Kids Expo! 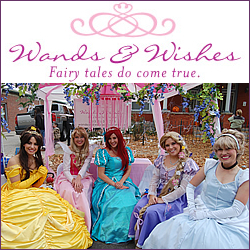 The princesses from Wands and Wishes will be available to say hello to your children and perhaps pose for a photo.